SEYMOUR — Rainy conditions that made pole vaulting unsafe Tuesday at the Naugatuck Valley League outdoor track and field championships put a celebration by the Woodland girls on hold for a day. Woodland held a 111-100 lead over Watertown as the Hawks pursued their sixth straight NVL title with 17 of the 18 events in the books on Tuesday. Woodland clinched the title on Wednesday getting a huge win in the pole vault from senior Julia Swiatek to give the Hawks a 121.5-118.5 win over second-place Watertown. Woodland’s Hailey Bernier finished tied for sixth in the pole vault to help extend the Hawks’ streak. On Tuesday, Woodland girls coach Jeff Lownds was pleased with the Hawks’ effort, especially in poor conditions. Erika Michie was the star for Woodland. 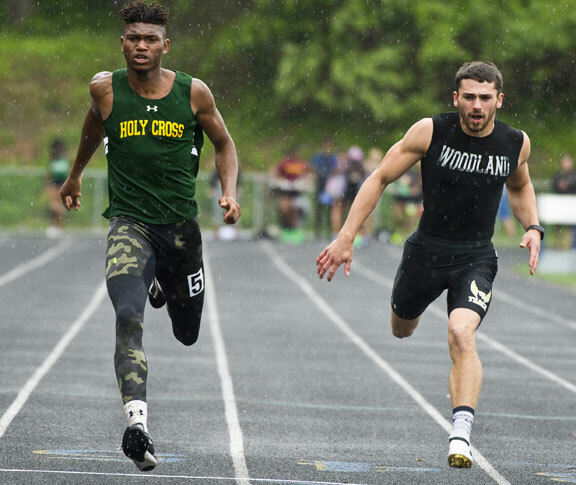 The senior, who was voted the NVL’s Most Outstanding Sprinter, swept the 100- and 200-meter dashes with times of 13.10 and 26.97 seconds, respectively. Woodland’s other individual event winner on the girls’ side was Jasmine Michie, who took the shot put with a throw of 34 feet, 9 3/4 inches. Kristen Persico earned medals in each of the three throws, finishing second in the javelin and third in the shot put and the discus. Another particularly valuable athlete in terms of point-scoring was Alexandra Cianciolo. 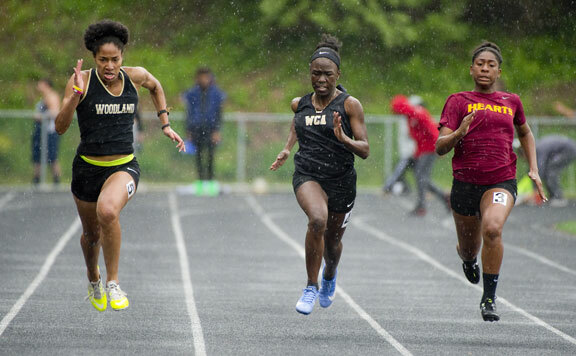 She placed fourth in the triple jump, fourth in the long jump, and fifth in the 100 hurdles to earn 14 team points. Lownds also pointed to the effort of freshman Jaden Young (third in the 800), as well as Jade Brennan in the mid-distance and Emma Slavin in the long-distance. The Woodland boys earned 30 points on Tuesday and settled in the middle of pack. On Wednesday, Craig Starkey added to the Hawks’ point total with a second-place finish in the pole vault. Senior sprinter Tom Smith overcame an injury-riddled year to finally win the 100-meter dash title and the crown of the NVL’s Fastest Man. He won the race in 11.16 seconds. Smith was the Woodland boys’ only medalist on a day in which the Derby boys dominated many events en route to another team championship.